SPD is celebrating the Letters to the Future: Black Women / Radical Writing anthology this Black History Month by offering 30% off titles by anthology authors and other radical black women writers. My book‘s on the list, as well as a lot of other Belladonna titles– work from some of my dear friends, allies and inspirations. “What is needed is a realization that power without love is reckless and abusive and that love without power is sentimental and anemic. Power at its best is love implementing the demands of justice. Justice at its best is love correcting everything that stands against love.” –Dr. Martin Luther King, Jr. This is the time of year when “love” gets packaged, hyped and sold in stores. Sentimental, old stories that serve the dominant paradigm are dusted off to fill the shelves, media channels and feeds. Narratives that may not look at all like our experiences, like our lives. Ideas that don’t promote our healing and care, or even our existence. Self-care has long been co-opted and marketed as a product for consumption. Being love is an opportunity to examine what love is on our own terms, in our own bodies and lived experiences. Through a series of guided meditations, writing exercises and discussion, we will explore love and self-compassion some of the roots of presence, resilience and equanimity. Why? To honor ourselves, our own experiences and to re-center narratives on our own truths. 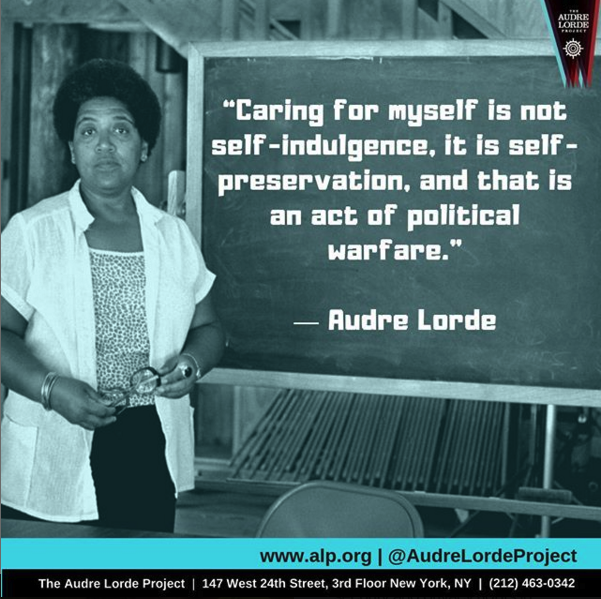 Audre Lorde and Dr. King spell it out: we examine and honor our own experiences as a means of self-preservation and as a source of political warfare against violent, oppressive systems. To serve the cause of the love that liberates and fosters justice, not the one sold in stores. Join us at metaDen Sunday February 10th 4-6pm. 52 Tompkins Avenue Brooklyn, NY. $10-20 suggested donation. 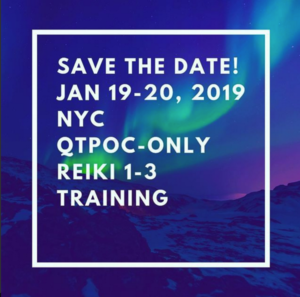 Bringing the healing in to 2019, NYC POC Healing Circle will be offering Reiki training (levels 1-3) in New York City January 19 & 20. 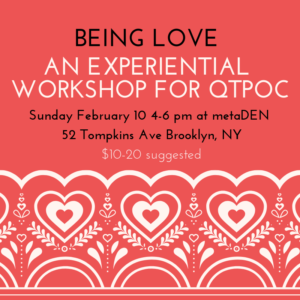 This event is for QTPoCs only, facilitated by QT healing practitioners of color.